What is known as a ‘lynx’ is actually any one of four distinct species: the Eurasian lynx (Lynx lynx), the Canada Lynx (Lynx Canadensis), the Iberian lynx (Lynx pardinus) and the Bobcat, (Lynx rufus). Especially one of these species (Iberian Lynx) is being monitored and is suffering from dwindling populations and is classified as ‘Critically Endangered’ – just one small step away from being extinct in the wild. Thankfully, efforts to preserve these cats are going well and the wild population seems to be gradually rising after reaching a critical low of 90-100 in 2005. The lynx’s infamy stems largely from the bobcat: a beautiful and often-misunderstood creature, all too often disliked by the people who encounter it. They have in some cases been able to adapt to urban environments, which is not ideal either for them or for the people living around them; they occasionally attack livestock, and have been known to raid litter bins or defecate in gardens. This is a saddening side-effect of the encroaching population into the bobcat’s traditional lands. All of the lynx are notable for the luminescence of their bright, reflective eyes. They each have black ear tufts, white fur on their undercarriages, large padded paws and long whiskers. They have ‘beards’, too: distinctive ruffs of fur below their chins, often with different patterns or markings. Outside of these similarities, the various species of lynx vary quite greatly. The Eurasian lynx is a very large cat, with a golden-coloured coat dappled with dark spots. They have pronounced grey and black ruffs and short, bobbed tails with black tips. The Canada Lynx is a little smaller, with a dense silvery-brown coat mostly free of markings. The Iberian lynx’s ruff is striped with black, and its coat is generally a brownish-grey bearing a smattering of spots – much thinner than the coats of the other lynxes. The bobcat, finally, is the smallest lynx – their coat colours vary, with wide faces and the characteristic bobbed tail. They have all, at some point, been prized for their fur. The fur trade is, alas, still alive and well – and lynx coats often feature amongst the most valuable of those still legal to hunt, kill, skin, sell and wear. The four distinct species of lynx live in four distinct areas, and evolved separately from a common ancestor (probably the Lynx issiodorensis, thought to have become extinct in the last glacial period of prehistory) to enable them to adapt properly to these varied environments. There is very little in common between their habitats, apart from the fact that even the most adaptable (which would probably be the bobcats) cannot live in entirely urbanised environments. 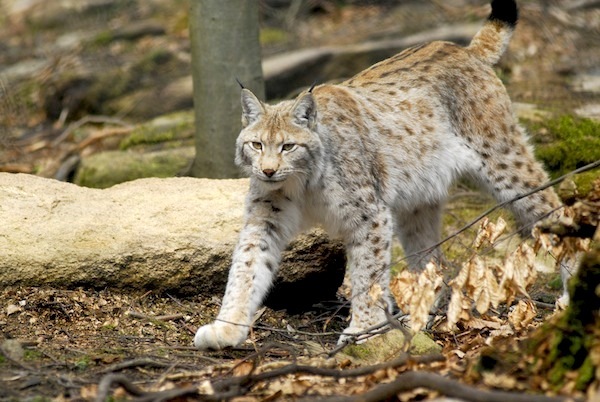 The Eurasian lynx is sometimes known as the European lynx, and lives – perhaps unsurprisingly! – across large swathes of Europe and Eurasia. Their range spans a massive amount of countries, including Albania, Belgium, Bosnia and Herzegovina, Bulgaria, China, Croatia, Estonia, Finland, France, Germany, India, Italy, Kosovo, Latvia, Lithuania, Macedonia, Montenegro, Nepal, the Netherlands, Norway, Pakistan, Poland, Romania, Russia, Serbia, Siberia, Slovakia, Slovenia, Sweden, Switzerland, the Czech Republic and Turkey. They are relatively adaptable creatures, and can live in snow or on rocky terrain. The Canada lynx is relatively commonplace in the northern forests of Canada and Alaska, and has also been found living in Montana, Idaho, Washington, Oregon, Utah, Minnesota, Colorado, and New England – though in several of those states they are extremely rare. They’re well adapted to living and hunting in cold, snowy climates, with large paws and thick fluffy coats. They do poorly in warmer climes, and prefer to live in evergreen forests. The Iberian lynx is severely endangered – the most endangered species of cat in the world, in fact – and lives only in Spain. 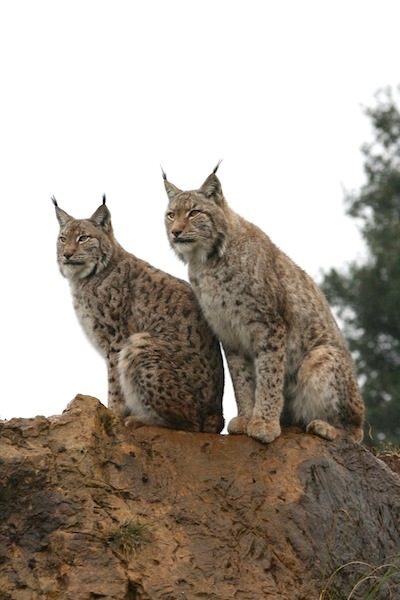 They are the least adaptable form of lynx, and can really only live in open grassland mixed with dense shrubs. This habitat is dwindling, which is not helping their populations to thrive. Bobcats, on the other hand, do relatively well in areas that are becoming urbanised – though they do need the wild to survive, and don’t live in urban areas permanently. They’re relatively often spotted by residents of Mexico and some parts of Texas, and there are occasional sightings in New York and the US Midwest. They can live in almost any conditions, excepting large open areas of heavily tilled or processed soil, and are perfectly at home on the edges of urban environments – where country meets city. Lynx of all species are mostly solitary, though from time to time they may travel or hunt together in small groups. They’re ground hunters, but they’re capable both of climbing trees and swimming – meaning that if all else fails, they can usually catch fish or birds. They seem to the casual observer like timid, easily scared animals, but this is more a preservation instinct than anything else. If trained by a professional, they can be tamed or even perhaps domesticated – and they’ve made reasonable pets to some who really do know what they’re doing and how to handle a lynx safely. They’re not inherently shy or secretive, like some cats are – but they are, like all cats, highly cautious. Most lynx will eat anything they can get their paws on: hares, rabbits, marmots, squirrels, mice, rats, grouse, foxes, boar, moose, deer, and any carrion they can scavenge or find. The exception to this is the Iberian lynx. They are rabbit specialists, and can pretty much only live off one particular kind of rabbit – the Oryctolagus cuniculus, of which they require between one and three a day. These rabbits have been largely wiped out by new diseases that have spread throughout their population, which is one of the major factors behind the Iberian lynx’s highly endangered and near-extinct status. Lynx mate primarily in the winter, and birth their kittens after a gestation period of about sixty-seventy days. Litters usually consist of three or four kittens, who then remain with their mother for around nine months before moving out to establish their own territories and young adults.